(Papers) IBPS PO Exam Paper - 2015 "Quantitative Aptitude Held on: 11-06-2015" | BANK EXAM PORTAL : IBPS, SBI, PO, Clerk, IPPB, Bank Jobs Aspirants Community. 1. At present, Pia is 6 years older to Roy. The respective ratio between the present age of Pia and Minis is 3 : 4. At present, Ray is 14 years younger to Mini. What is Ray's present age? 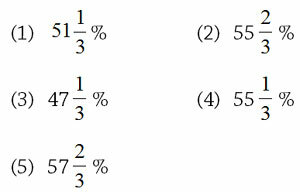 Directions (2-6): In the following questions, two equations numbered I and II are given. You have to solve both the equations and mark the appropriate answer. Directions (7-11): Study the table to answer the given questions. Note: Other than the mentioned expenses under the given heads, there may also be some other expenses. For calculation purposes, please consider the given expenses theads only. 7. 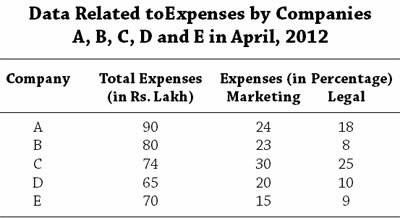 What is the respective ratio between the Marketing expenses of company A and the Marketing expenses of company C? 14. 8461 ÷ 11.99 - 24.1 ÷ 5/100= ? 16. f14.855 of 679 + 19.95 of 219.89 = ? Direction (17-21): What wil come in place of question mark (?) in the given number series? 18. 7 9 18 46 11 ? 22. A bag contains 5 red balls, 6 yellow balls and green ball. If two balls are picked at random what is the probability that either both are red or both are green in colour? 23. If a 140 L of mixture of milk and water, percentage of water is only 30%. The milkman gave 20 L of this mixture to a customer. Then he added equal quantities of pure milk and water to the remaining mixture. As a result the respective rartio of milk and water in the mixture became 2 : 1. What was the quantity of milk added? 24. A boat can travel 4.2 km upstream in 14 min. If the respective ratio of speed of the boat in still water and speed of the steam is 7:1. How much time will the boat take to cover 17.6 km downstream? 25. A starts a business with a capital of Rs. 1500. B joins the business 6 months later from the start of the business and C joins the business 8 months later from the start of the business. End of the year their respective share in profit was in ratio of 5 : 3 : 3. What is the sum of amount put in the business by B and C together? 26. The length of a rectangle is 4 m more than the side of a squre and the breadth of the rectangle is 4 m less than side of the same square. What is the area of the square is 567 sq m, what is the area of the rectangle? 27. A sells an item at 20% profit to B. B sells it to C at 10% profit. C sells it to D at Rs. 16 proft. Different between the cost price of D and cost price of A was Rs. 500. how much did B pay to A for the item? 29. Rs. 16000 was invested for three years, partly in scheme A at the rate of 5% simple interest per annum and partly in scheme B at the rate of 8% simple interest per annum. Total interest received at the end was Rs. 3480. How much sum of money was invested in scheme A? Directions (30-34): Refer to the graph and answer the given quessteions. 30. 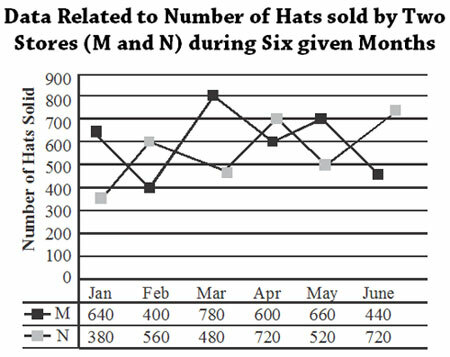 Number of hats sold by stores M during January is what percent of the total number of hats sold by the store N during March and April? 32. Stores M and N sells only two types of hats: Fedoara Hats and Tribly Hats. If the respective ratio of total number of Fedora hats to total number of Trilby hats sold by stores M and N together during March is 8:5, what is the total number of Fedora hats sold by stores M and N together during march? 33. If the total number of hats sold by stores M and N together in July is 15% more than the total number of hat sold by the same stores together during June, what is the total number of hats by the same stores together during July? 35. Monthly salary of Dex is one-fourth of his father's monthly salary. Dex's sister's monthly salary is two-fifth of their father's monthly salary. Dex's sister pays Rs. 12800, which is one-fourth of her monthly salary, as study loan. Savings and expenses made out of the monthly salary, by Dex is in the respective ratio 3:5. How much does Dex save each month?